I wanted some arepas de queso (cheese arepas). Arepas are usually served in Central American restaurants. Antojitos Aminta serves Salvadorian food. I like it all especially arepas with the vinegary, pickled cabbage slaw. If you, as a reader, do not know what an arepa is- it is similar to a thick corn tortilla stuffed with cheese (I don’t know what type, but probably a Centroamerican version of mozzarella). I recommend going here if you are in the Mission area of San Francisco, but not if you are in a hurry. My parking meter was running out time and la señora making my food was taking her sweet time shuffling around the kitchen. Any other time I would not have minded. But since I was in a bit of time crunch, I started to get antsy. Yum! I’ve never tried this before, but now I’ll be on the lookout for Salvadorian restaurants. Thanks for the culinary education! Lived in S.F. 20 years. Been another 20 since I’ve been back. Wondering what the mission looks like after all this time. 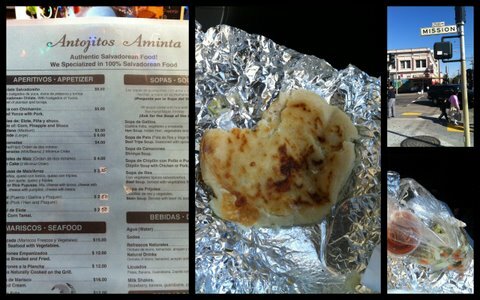 arepas de queso also new to me. It seemed that Mission is now a shadow of its former glory. There were a lot of empty buildings in the area where I was. A few discount stores, quick marts, and, of course, restaurants. There was one shoe store that I could have spent all day in (much to the chagrin of my hubby) because shoes were FABULOUS! Originally, going to Mission was not on the list of tourist things to do, but I was tracking down a cupcake bakery that I found on Groupon Now. The lengths I will go for cake. All in all, it turned out to be a nice trip.